One of those oft-repeated, slightly overused societal adages dictates that the more things change, the more they stay the same. In the case of those delightful Roanoke-ians Eternal Summers, this is very, very true. And, lest you furrow your brow at that sentiment, a very, very good thing indeed. For even though the band's sound has evolved from that of the scuzzily poppish scamp of an LP Silver, it remains irrepressibly and inescapably awesome. The cheeky briskness of the debut jangle of Silver has been amped up on Correct Behavior - having ingested a heaping helping of John Hughes-ian bittersweetness, general glacially cool 80s popness, and seriously bitchin' riffage. The first three songs, it must be said, are so very good that it took me quite a good long while to tear myself away to listen to the album in its entirety. But I finally did, and, spoiler alert, sweet friends: Correct Behavior will be on my list of 2012's absolute best. "Millions" is first, a glossy, almost grown-up jolt of exhilaratingly fresh air, with Nicole's (she who was "born inside a volcano") vocals reaching a lovely state of pitch perfection. "Wonder" probably nabs favorite song dibs amongst a whole record full of favorites, all delirious dizziness and infectiously fuzzy. It's adorably rambunctious, and to me it epitomizes the Eternal Summers sound in a mere two minutes and fifteen seconds. The last of the impeccable first three is the majorly, all-consuming catchiness of "You Kill." Seriously chunky riffs play off the breathiness of Nicole's vocals, and the song builds to a splendidly harried crescendo. At the risk of ruining the suspense, the rest of the record is actually just as wonderful as the big three. "I Love You" wouldn't sound out of place on Silver, all playful instrumentation and an askew, quick pace. Not to mention the song's highlighting of the Summers' wry sense of humor ("I love you/You do too/You love you"). There's a couple terribly good slowburners on Correct Behavior, "It's Easy" and "Good As You," full of meaningful glances and subtle melodrama. 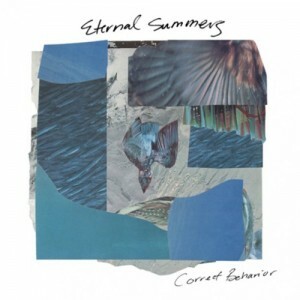 Ethereal closing track "Summerset" falls in line with bands like Beach House, Lower Dens, Blonde Redhead, and Wild Nothing, though of course retains that Eternal Summers vibe. In short, friends, I cannot encourage you enough to get your hands on this one. It's impossible not to fall in love with it, and to fall head over heels for these three Roanoke'n'Rollers (yeah, I said it).